Using maps to track the spread of diseases has a long history and in the past has often helped to contain or stop their spread. Perhaps the most famous disease map is the spot map created by John Snow in 1854. Snow created his map to plot the location of cases of cholera in Soho, London. The map helped to prove that the Soho outbreak of the disease was caused by water that came from one pump in Broad Street. The dominant theory at the time was that cholera was caused by "bad air", so John Snow's map helped to prove the true cause of the disease. None of the maps below are likely to help us overcome Swine Flu and most of the maps are far less accurate than the map created by John Snow. However these maps do give us a reasonable overall impression of how the outbreak is spreading. 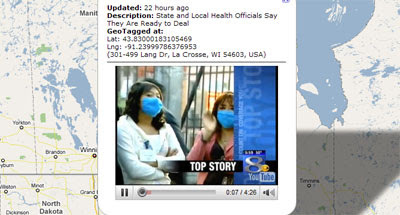 This Google My Map seems to have been the first map to have been created to track the Swine Flu outbreak. The map was created by Dr. Henry Niman a biomedical researcher in Pittsburgh, Pennsylvania. The map, which has generated nearly 400,000 views so far, is embedded below. The FluTracker Map uses data from Dr Niman's H1N1 Swine Flu My Map. The data is compiled from official sources, news reports and user-contributions. This Google Map shows the spread of Swine Flu in Mexico. The map is a collaborative, social sharing attempt to map the epidemic, which requires user input. If anyone knows of an outbreak of the flu they can add the information to the map by clicking on the location and entering the details. 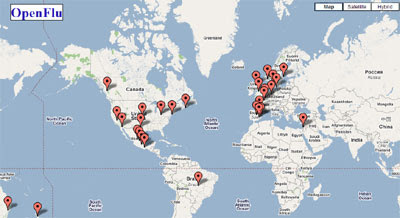 Wikiprotest have embedded the H1N1 map above in their blog and have also found another Google My Map of the H1N1 Swine Flu Outbreak. This My Map is marked as 'open collaboration', which means that anyone can add to the map if they know of Swine Flu cases not yet on the map. 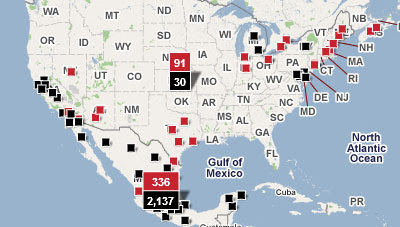 This map uses black markers to indicate confirmed deaths and red markers to indicate confirmed infections. Question markers on top of the markers indicate that it is a 'suspected' death or infection. 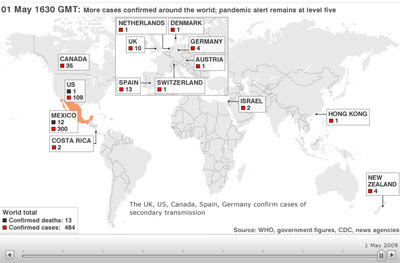 This map seems to show that the outbreak may have already reached Europe. The BBC map does not use the Google Maps API but I'll include it here because it is likely to be one of the most accurate maps in this list and because it has a good timeline of the spread of the disease. Swine Flu Map Animation - this map uses a number of maps created with the Google Chart API to create an animated timeline of the outbreak. Swine Flu Cases in Western Europe - this My Map is tracking the outbreak exclusively in Western Europe. Swine Flu Heat Map - This site uses the Google Visualisation API to produce a heat map of the outbreak. The site also contains a time graph so you can view the increase (and hopefully the decrease) in cases over time. RSOE -Pandemic Monitoring System - Full screen Google Map of the Swine Flu outbreak with a rolling ticker of the latest news on the outbreak in each country. Hey, AWESOME map, with great detail. Please, PLEASE keep it up to date -- a lot of us are tracking it along with you! Hey there, this is another API with AJAX and PHP for the swine flu, in Mexico (for the begining), is starting. PLEASE help us to difuse it along the society. Hm, interesting map indeed.... Following it from the Netherlands with interest as well. an employee of British airways. the case was reported in the Uk's guardian. That Case regarding the Air Steward has proved negative - there are now (at point of commenting) no reported cases in the EU. Great idea to put this map up. Here is a map that I have created to track the origins and destinations of the infections/cases. "Map of 2009 Swine Flu H1N1 outbreaks and migration paths reported from news and government agencies. The map lists reported dates and paths of infected persons traveling." Note that many infected travelers have gone through Cancun and not Mexico City. Sorry...I started this on Live Maps and now have too much info in it to switch back to Google Maps. thank you much for the origins/destinations map. Very helpful, although I'm bummed as I'm traveling to Cancun in a week and was hoping it hadn't reached there yet. Quite useful maps. Hope it helps tracking down the source and most contaminated areas in order to avoid them until situation is OK. So I am supposed to leave for mexico tomorrow morning... My mom is freaking out and now my birthday is ruined! The H1N1 Swine Flu My Map above includes areas of discussions and precautions as well as *actual* cases of Swine flu, so (for NC at least) is incorrect. 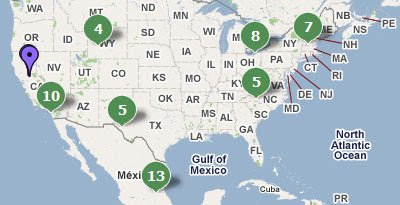 I'd suggest placing only the confirmed cases on the map. I think we can pretty well assume there is someone everywhere who may/possibly/could have been infected, so that info is *not* helpful nor worthy of mapping here. There has been a confirmed case in Orlando Florida. Someone visiting Disney....Why isn't it posted? Thanks Michelle. I think the danger of maps like this are that they can cause a panic by posting reports that are inaccurate or unconfirmed. I can't see any source attribution attached to these map markers which makes me very suspicious. If anyone can confirm that this is indeed info from the CDC or WHO, I'd like to be see it. Withe each and everyones help fighting this infection hopefully we can stop its spread very soon. 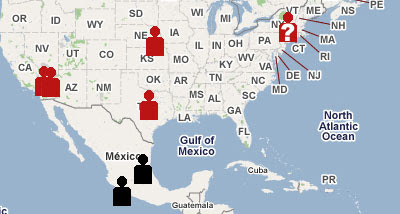 How could i track 4 this map the new two italian suspected cases? Thanks to Google for this useful map. This website http://www.swine-flu-tracker.com/ shows you in real time how quickly swine flu is spreading. We used Google Maps to. Check out our cool animated map that shows the spread of Swine Flu across the US. 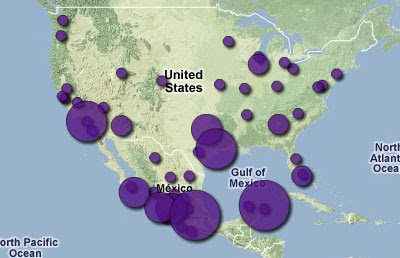 check out flutracker.rhizalabs.com for a dynamic, interactive map of swine flu base on henry niman's research. Have there been any confirmed cases in Cancun? Wow, great maps. Just wondering. I am in South Africa and we apparently have 2 confirmed cases of Swine Flu and yet it is not mentioned by WHO or you guys. Guess you either do not have the info or we are wrong - who the hell knows what info gets out of the country LOL. I thinkt this spreads mainly panic. For example the guy in Switzerland turned out not to have the swine flu at all. i think theres a certain limit to open source philosophy in an issue such as this. Share an interesting blog specialized in charting swine flu cases on a time horizon. You may see a trend there. Map we did by state for the AJC. Based off CDC confirmed case data. Very up to date. The best map on swine influenza spread I've seen in on http://www.elmundo.es/elmundo/2009/graficos/abr/s4/gripe_porcina.html (the Spanish newspaper. A pity it's not daily updated. there are 194 reported cases in ireland said RTE news. thanks for sharing this map to us, there is a Hugh possibility to treat swine flu by herbal treatment. It is sad that even with so much medical advancement nothing could be done to stop the flu. Great blog, Must have taken a while to gather all that info. Awesome thanks. We've also developed a symptoms-based map that tracks the spread of disease at local an global levels. Check it out at www.germtrax.com - we would love your feedback!